Checking guests in can be a very pleasant experience. You get to meet your guests for the first time, and understand more about why they’re visiting. It’s also the opportunity for you to present them with the keys to your property, and to show them around the place. It’s a great way to learn about your guests and be assured that they will take care of your property. But then there are also times when checking guests in can be a major pain. Flight delays for example, or traffic jams, mean that your guests could turn up much later than expected. You could be spending hours waiting for your guests, with constant updates from them saying that their delay is extended. Even when things go according to schedule, there are situations in which guests’ arrival times are not the most convenient. They may plan to check in during the wee hours of the morning, as they unfortunately happen to arrive at your property during that time. While you’re usually happy to meet guests for check-in, you honestly may not be keen to wake up at 3am to let them in. There is a simple solution to the check-in issues you’re facing. Hosts have shared that they use an old method which works, but is not the most secure – hiding the door keys. They can be placed under the door mat, in a flower pot, hidden behind a ledge and so on. 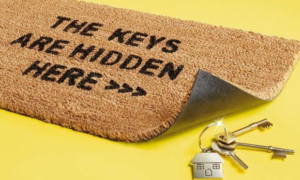 This method is reserved for the bravest of hosts, who are willing to take the risk that anyone (even those with ill intentions) can also locate the keys to your property and enter easily. Of course, it is convenient for the host, and lets you do away with having to be there during check-in. Lockboxes are not uncommon in countries like Japan and Australia. 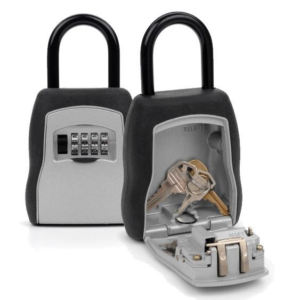 Essentially, you secure your lockbox to a door handle or railing, and keep your keys inside. You manually set a PIN code, which you give to your guests so that they can use it to unlock the lockbox. Sounds straightforward enough. In terms of security, this is an improvement over hiding keys. Also, lockboxes are pretty low-cost. But lockboxes are not the perfect solution either. What often happens is that during check-out, guests punch in the code for the lockbox and then place the keys back in it. They then close the lockbox without clearing the code. This means that your supposedly secure PIN code is still shown on the lockbox, in plain sight for everyone else to see. As such, it ends up practically announcing to the world that your keys are free to take. Also, PIN codes need to be manually set on the lockbox, and many hosts may not visit their property frequently. They end up using the same PIN code for many visitors. So if a previous guest decides that they want to enter your property again, they simply use the PIN code which you’ve given to them in the past. To keep your property safe, time-sensitive PIN codes are the way to go. PIN codes that are valid for specific durations, such as 24 hours, or 3 days or 2 weeks, free you from worrying about unwanted guests in future. 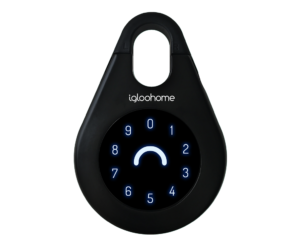 The igloohome Smart Keybox lets you create time-sensitive PIN codes or bluetooth keys via a mobile app. Since granting of access can be done from your smartphone, you could let guests in even when you’re on the other side of the world. There are even access logs of when bluetooth keys are used to unlock the Keybox, so you have a record of the exact date and time at which a guest has retrieved the keys. While the pricetag of the Keybox may be higher than that of a conventional lockbox, the convenience and peace of mind it brings the host more than justifies the amount that you’re paying for it. As igloohome is a preferred partner of Airbnb, you can choose whether you would like full automation of check-in at a small fee each month. This means that when a guest makes a reservation on your Airbnb listing, a PIN code valid for their duration of stay is created and sent directly to him or her. So there is no need for the host to even lift a finger for check-in.